On my last trip to Mumbai, I discovered a café in the lobby of our hotel that looked like it had stepped out of New York or London or some other big city. The menu featured trendy sandwiches and salads and soups. Where was pav bhaji and sev puri and pani puri,I wondered, as I looked at the menu. Bombay had so many unique and delicious street foods to offer. Surely a Chowpatty bhel puri merited the same fame as a portabella mushroom panini? It was then that I stumbled upon the special of the day which read “Bombay grilled chutney sandwich.” This was a simple street sandwich, white bread layered with a tangy and spicy green chutney and stuffed with slices of tomato, cucumber and white cheddar cheese. As I took a bite, I felt that I was tasting something of the real Bombay that lay outside the sublime air of the hotel. This mint chutney is easy to make, and lasts for a few days in the refrigerator. It tastes very good with many things, but I love slathering it on open-faced sandwiches with simple vegetable and cheese fillings. Update July 2011: My aunt who visited recently read this recipe and said that potato is a MUST in chutney sandwiches. Mix in chopped boiled potato with the chutney and layer into the sandwich. 1. Blend all the ingredients with minimal water to make a thick paste. Use this recipe as a basic guideline, varying ingredients to taste. Note, you can play with the flavors of this chutney by adding small quantities of garlic, ginger, raw green mangoes, and tamarind pulp. 2. 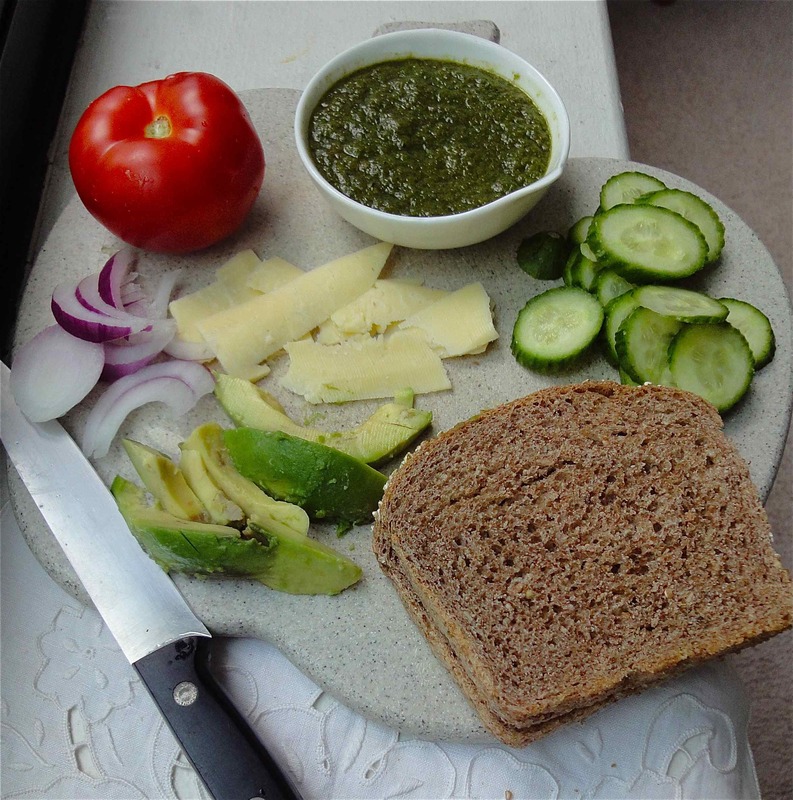 Spread on bread and layer on sandwich fillings of your choice, such as lettuce, cucumbers, tomato, avocado (not Indian, but very tasty with the chutney), green peppers, diced boiled potatoes, cheese, and onions. The sandwich can also be made with toasted bread or can be brushed lightly with butter and grilled in a pan. Alternatively, the chutney can be drizzled on an open sandwich. hmm hmm! it is defenitely cucumber chutney sandwich season! we are totally having the same cravings! lol! i like that you put avocados in this.